RUD Australia was engaged by Humes Holcim to engineer a lifting design to position the deck units and piles. RUD completed the lifting design for all the deck units and piles for Humes Holcim. 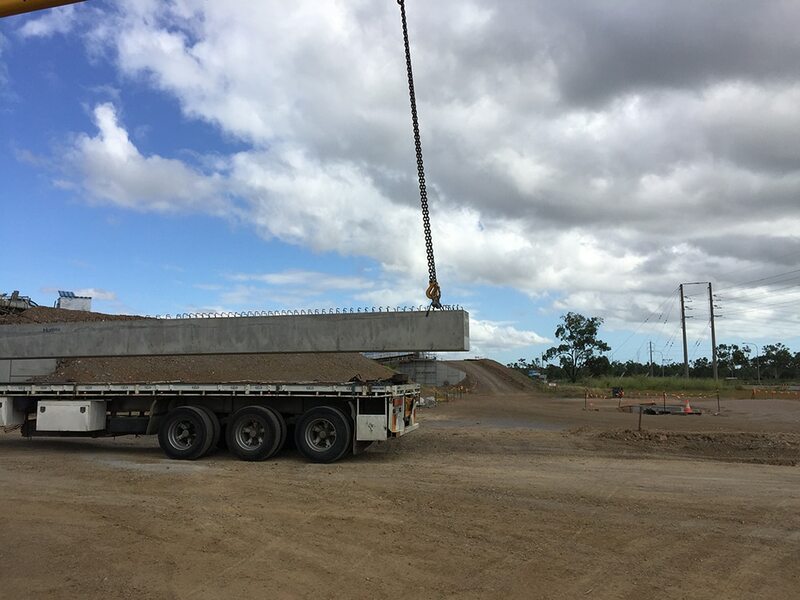 This involved the design of a 35t x 25m modular spreader beam – manufactured, proof loaded and certified by RUD Australia in Brisbane, including the use of innovative cast in lifting hoops – a safer and efficient solution for lifting heavy pre-stressed units. The spreader beam improved safety and efficiency for lifting heavily prestressed units. Design, manufacture, proof loading and certification completed by RUD Australia. Tagged with the Working Load Limit (WLL) rating. 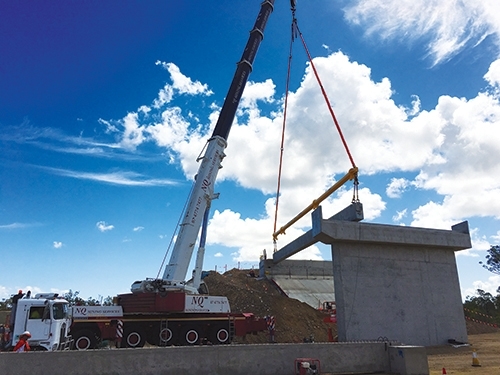 RUD Australia’s safe, lightweight and cost-effective lifting solution ensured that ring road construction could progress under tight timeframes. Speak to a RUD Australia expert to find out how our engineering expertise can help you manage project risks and schedules. The most important aspect of any lifting device is its safety performance – on the TRR4 project we required a lightweight multipurpose modular spreader beam. RUD and Bullivants were able to meet our specific requirements for WLL, multiple spans and most importantly the tight delivery time frame. The spreader beam has been simple and easy to use and a real asset to this project. We were very pleased with the performance of the RUD Cast-in Lifting Hoops and the RUD Vario spreader beam, and look forward to using them in the future on further projects. The RUD team were able to design, manufacture and supply a cost effective solution for the TRR4 where others could not. RUD worked within the performance requirements and time constraints to deliver a practical solution to these critical lifts. We see our long term relationship with RUD more as a partnership than supplier and customer. RUD’s service and product support are excellent and their team of industry specialists is always on hand to answer any of our questions. 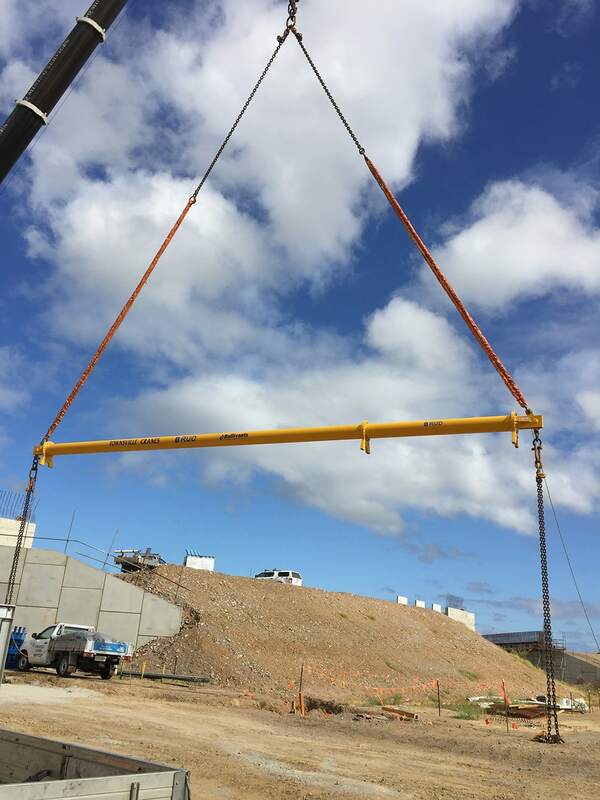 Humes Townsville have used the RUD Cast-in Lifting Hoop on numerous projects in the Townsville Area. In TRR4 a combination of 12.5t, 16t and 20t hoops were used in both prestressed piles and decks. The engineers at RUD compiled the lift plans in accordance with TMR requirements and worked with Hume to ensure a timely delivery schedule was adhered to. The Cast-in Lifting Hoops are cost effective to use, quick and easy to install and handle. The wide range of sizes/capacities available gives the site team confidence in designing the most suitable lifting arrangement for each pre-cast element. The pre-cast team at Humes Townsville recommends the use of the RUD Cast-in Lifting Hoop and we look forward to being able to use them on future projects and across all products. This beam is simply the best in town and is a real asset to our Crane Fleet! It gives Townsville Cranes a competitive advantage as other beams of similar size are twice the weight. We look forward to working with RUD again to increase the capability of our rigging gear throughout the fleet.